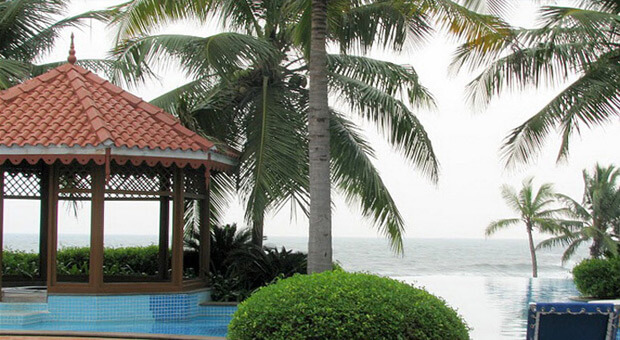 Radisson Resort Temple Bay Mamallapuram, the largest Resort on the Coromandel coast, offers you an experience that is exotic, spread over 44 acres of plush green carpet on the shores of Bay of Bengal. Radisson Resort Temple Bay boasts of having the longest Meandering Pool of 27000 sq.ft, running through the heart of the resort and an Infinity pool that form the core and private plunge pools, with various levels of accommodation and activities centered around these water bodies. With less than an hour drive from Chennai airport, Temple Bay is at an ideal location for visits to the heritage centers in South India like Kanchipuram and Pondicherry. Radisson Resort Temple Bay plays an ideal host for your corporate team outings, indoor / outdoor conferences, wedding and private parties. For a fun-filled stay or for team building, try your hand at catamaran rides, zorbing, beach volleyball and putting. You can unwind and relax with ayurvedic massages at the Spa or workouts at Pranayam, the health studio.